This is the start of a weekly series focused on side income hustles. We could all use some extra income on the side. So be sure to check back each week for new ideas on how you too can make some money on the side. The web has brought us unprecedented opportunities to make an income whether full time, part time and or on the side. The trick is to know where to look, and the various opportunities available. Ever since high speed internet made a splash some years ago, along with the advent of smartphones and now tablets – all heck has broken loose in the internet web work landscape. You see the web is powered and advanced by a few key things; content, design and optimization. In any and all its various forms, a website needs these three things to exist and flourish. And as such properly trained individuals are needed to provide these key things, but it gets even better because these three key things are an ocean onto themselves with many smaller ponds and lakes branching out into related fields. For example, with the large overall field of web optimization comes the need for individuals trained and skilled in the smaller and niche area of search engine enhancement, with design comes usability and user engagement, and with content there’s a whole slew of niche areas to go into from there. 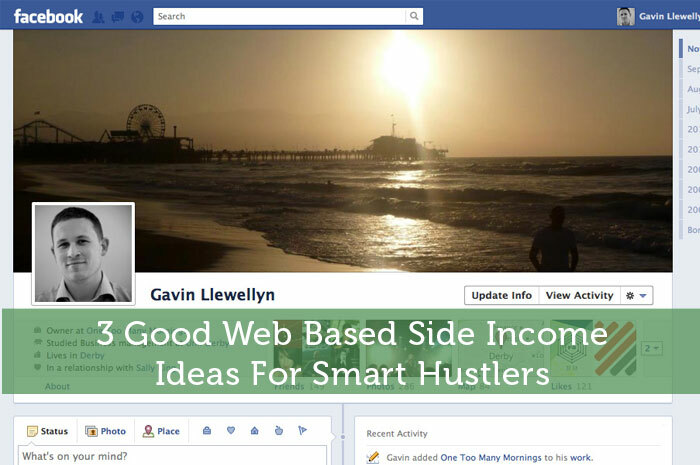 See three specific and detailed example web based side income niche ideas below. Agree? Disagree? Tell me in the comment area. With social media becoming an increasingly popular method for promoting just about anything someone would want to promote, it has become a mega career field in and of itself. Anyone can put together a Facebook fan page, bu only those trained and skilled in this area can actually make a successful, active and lead generating Facebook fan page machine. Whether you’re self taught in social media or went to a fancy pants school, results are what matter to a prospective client. Can you organically grow Twitter followers? Do you have a knack for user engagement on Facebook or Google Plus? Some people are naturally gifted at social media and if you happen to be one of these individuals, make no mistake about it – your skills are in HIGH demand. Create a blog and website and put the “For Hire” shingle out as soon as you can, because there’s an army of small business owners out there who desperately need your help and will gladly pay for the help. This is a big money maker right now and the sooner you make it known that you’re available, the sooner you will start to gain clients and make more than a side income. Ever since Facebook came out with the new Timelines design, this instantly created an opportunity for smart and creative designers to put out an APB on their clients needing fresh new designs. Since the Timeline covers and corresponding profiles were completely revamped with new sizes and placement, just about every Facebook fan page owner has had to adapt. No one is immune to the change. This is a prime opportunity for any and every web designer out there, including you. Let everyone you know that you’re offering custom Timeline design covers and get the word out via your blog and social networks. You might be pleasantly surprised by the interest in this super cool service and the smart clients coming your way. But you must charge appropriately, and this is mostly determined by your demand. If you have set up some sort of client lead system and you start getting hammered with clients, then you can pretty much charge what you want. But if you don’t have a client list or a client lead system, then lowered rates are your foot in the door and you should charge what the market tells you to charge. It doesn’t matter how awesome you are as a designer, if you have no clients, it doesn’t matter. You need clients, then you can name your price. Try out different price points and see which one sticks. Then go at it – full force. Notice I didn’t just mention web content writer, but I mentioned “real estate web content writer” and there’s a reason for this. Because with the internet being as large as it is, you need to niche your way to a client base. If you go after everyone, you’ll get no one. But if you tailor your message to a very specific group of people, then you’ll know how (and where) to market to them. Take for example, real estate professionals. Where do they tend to hang out online? What social networks do they belong to? What sort of web content would they most be interested in? You see what I’m getting at, marketing all of a sudden becomes way easier and smarter. If you’re a good writer, you’re in HIGH demand. Get that website or blog up as soon as humanly possible and start getting out there on the interwebs and get your name out there. All sorts of online business owners and web publishers – need your help. It’s all about knowing your strengths, your current skill set and how you can adapt these to the web. There are millions and millions of website and blogs on the web, and they all need your help in one area or another. Get out there and stake your claim. What are you currently doing on the web for income? What do you WANT to do for income, that is web-based? Tell me below in the comment area. I wish I was web savvy because there is little doubt that’s where our world is headed. I enjoy what I do though and I really have no regrets…what I really need to focus on is how I can take my primary business and develop it into an online service. Thanks for being the first to comment. I agree with you 100% and also think that digital and web based is where we are all headed – like it or not. But this only means there will be a boon for many industries online, so not all is lost. Hey Jason, I also wish I was more web savvy so I can program all the apps I have in my head :(. But if you want to get started on web design as a side hustle, you don’t need to know much to get started with it…just the basics. Of course your target won’t be e-commerce or tech companies. But if you aim at the little mom&pop/one man businesses, you can create a niche for yourself there. All they want is a simple 5-10 page website with their logo up top and a navigation menu. When I build websites for little businesses, I work solely on WordPress and solely with Thesis. I have a stash of code in my inventory so I do little to no coding. Anything you need help with when it comes to coding with WordPress, you will be able to find it online. That was how I managed to “code” sites for clients. Now I do less and less client work and work on more of my own sites…I have over 30 .sites that I’m hoping will be all done by the end of this year :X. Of course you have to charge the value you provide…so with my simple websites, I couldn’t charge much ($400 for a website and $800 if it involves an online cart). Just my 2 cents. Thanks for chiming in with your feedback. It sounds like you have a good thing going with your “little businesses website” idea. How do you canvas for new clients for your website gig? Do share more, as the readers of Modest Money could surely benefit from your reply. Hi Missy – I currently do a bit of freelance editing and proofreading on Fiverr. Not a big money maker by any means, but it is easy work. I’ve noticed that real estate professionals like to hang out on Twitter. Thanks for bringing some new ideas to this topic. Glad you enjoyed my piece and got some fresh new ideas from it. I love the idea of niche content writer. Good stuff. I didn’t realize the demand of social media experts until recently. A company reached out to me to manage their social media and blog content, based on how interactive I was with my personal blog/accounts. Like you said, it’s a niche in high demand and something I actually enjoy doing. Getting paid on top of that is a great bonus. What a great example of how in-demand good social media users are. Did you end up taking the gig? Apart from owning my blog I am not doing too much online for income but that will change. I am hoping to launch another business site soon that should be good for some regular income. I don’t have specific statistics on blog owners who go on to start other blogs, but I can bet you it’s pretty high. Once you create one, another is not too far behind. Lol. It’s kind of addicting, the whole process. Especially if one of your blogs becomes a nice success. You then want to sort of prove to yourself it wasn’t some fluke and can do it again. Great post and I’m looking forward to reading this every week. I am still, what I like to call, in the beginning stages of making money online, since it is my plan to turn my unemployment status into a full time job by working online. I just want to stay home, enjoy life and raise my son… nothing more. Good luck in your job search. Hopefully some of my ideas above have given you food for thought. I blog and blog and blog! I don’t know where blogging will take me, but for now, it’s nice to have a goal to make it grow.. in hopes that the money will come later. I love to network, especially online. It’s important to network online, it can lead to nice things. Its actually one of the awesomer things about the web. I agree that niche content writing is a great way to make extra money! It’s also a lot of fun for people who truly love to write and have knowledge in a specific area. Plus, it’s a great way to build professional contacts and could turn into something more! I love writing as well and pretty much do it day in and day out. It’s how I pay my bills, so I must be doing something right. Luckily for me – there’s huge demand online for good writers. I would love to do real estate content writing! That’s a great idea. I love real estate, I love writing, and I LOVE makin money! Try venturing out there in online real estate circles and make it known that you’re available for writing gigs, you might be surprised – as to the demand. I think you’re right on about the need for social media and management helpers. People will pay good money for help! And it can certainly be a side, online hustle! Did you notice the comment above from Carrie. She mentions someone reached out to her about doing social media work for them, since they noticed how active and good she is with her own account. What a great example of how the social media career field works. eBook formatting business? How would this work, do you mean you would be helping people set up books for the Kindle, Nook, iPhone, etc. If so, would love to hear more. Yes, that is what I do. I have two tiers of service for authors. For the first tier, I take the manuscript, do the neccessary editing to allow it to convert well, convert the file, and then check it to make sure it came out right. For the higher tier, I act as a publisher and publish it on Amazon KDP & B&N’s PubIt!, plus other outlets as I can get access to them. I like the idea of creating a side income from the internet. The possibilities are pretty much endless and it’s easy to experiment to see what does and doesn’t work for you. There’s lots of people making a nice income from the web, it’s all in knowing how and where to find the opportunities. I hope my article above is turning the wheels for you. Other than that I make a bit on Adsense but I make way more doing paid posts. I also make a bit selling products that I am affiliated with. My latest niche blog is just starrting to bring some money in and in time I reckon it’s going to me my main money spinner. I remember you from way back when, nice to see and hear your blog is still making the rounds. Looks good. Am sure you’re doing quite well with your various blogs. Always Missy, and nice to see you doing the rounds. Must pop on over to see what you’ve been up to. All three of those side hustles are great. I been a Real Estate blog writer in the past, but slow response time from the Realtor and no true idea on where to take the blog to made it frustrating. I did enjoy the cash that came in on the side, who knows maybe one day I’ll get back into it again. I would be interested in writing for other blogs for payment. I specialize in investments. Do you have any suggestions for me as to where I would start looking for blogs that would pay me to write content for them?